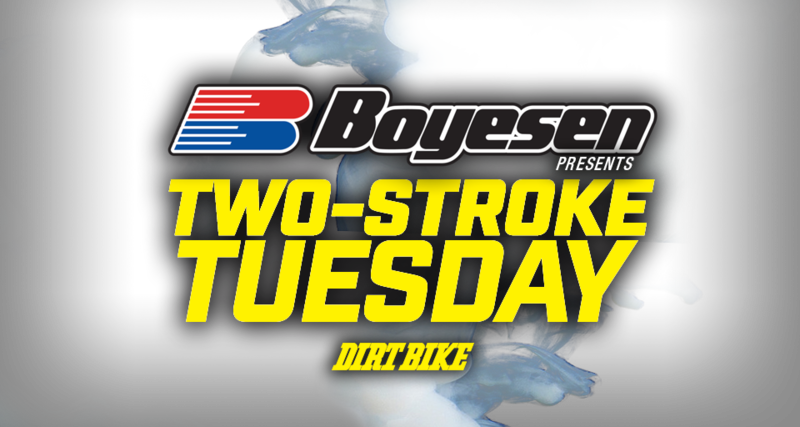 In this weeks 2-Stroke Tuesday brought to you by Boyesen we go a little JS-7 crazy. James Stewart might not of lined up for the opening round of Monster Energy Supercross but we have pictures of his race bike . Ok, ok its from 17 years ago but for those of you missing “Bubba” it will have to do for now. Stewarts full blown factory Pro Circuit KX85 still looks trick over 15 years later. With the powder coated frame, black rims, graphics and tire stickers this bike could line up in the 85cc mod class as is. Not bad for a bike that was on showroom floors in 2000 ! The Pro Circuit power plant put out more power than most stock 125s at the time and Stewart used every bit of it. The Pro Circuit clutch cover just screams factory. Pro Circuit was one of only a handful of companies offering aftermarket triple clamps back then. This machine is equipped with solid mounts with custom bar riser. Check out that vented front number plate. 17 years later this Dave Kelly tuned machine still looks trick. N-Style was setting the graphics game insanely high back in the late ’90s and early 2000. . Nothing says factory like carbon fiber. Stewarts KX85 was adorned with carbon frame guards and rear chain guide. Front sprockets are manufactured to O.E.M., specs using high grade hardened steel. Rear Aluminum Sprocket made from 7075 T-6 heat treated Aluminum. Come with self cleaning grooves. All match original equipment exactly for perfect fit and size. The ORH Gold X-Ring chain is Primary Drives best off-road chain for performance and durability. Features gold plating on the plates. X-Ring shape provides an outstanding seal with reduced friction. Average tensile strength 8,120 lbs. Retail Cost : $ 109.00 and up. CASTOR 927 is a unique blend of highly refined castor oil, a specially prepared synthetic and an additive system that reduces carbon and gum formation and provides excellent rust & corrosion protection. Contains an exclusive additive that keeps power valves cleaner and working properly. Keeps lubricating and fights carbonizing or vaporizing Provides extra protection on cylinder walls, bearing journals and other critical areas at high temperatures. Here is a little sneak peek at what we have in store for you next week. Who remembers this bad boy !